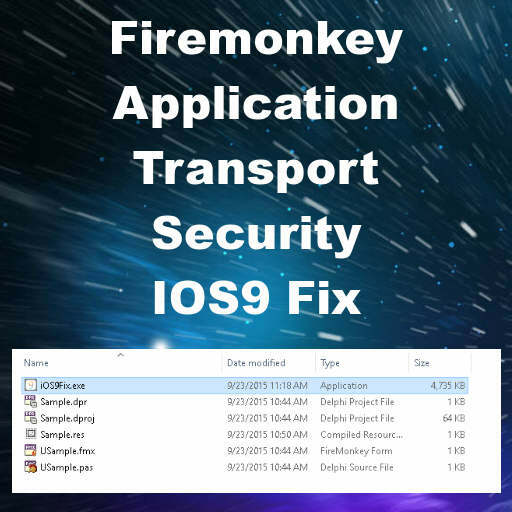 Developer Pieter Scheldeman from TMS Software has a blog post up about a free patch you should apply to your Info.plist file if you are deploying any web browser functionality (or AppAnalytics) to IOS9 with Firemonkey in Delphi 10 Seattle. Basically Apple has a new feature called Application Transport Security which allows an app to restrict what HTTP addresses it is able to access. You can add a key to your Info.plist file which opts your app out of the Application Transport Security (ATS). Alternately there are a bunch of different ways to configure ATS and you can read about them here (thanks to a G+ post by Patricia Ehrismann) and here. In any event Pieter from TMS Software has the best solution for this that I have seen. Basically he has provided an IOS9Fix.exe that you add to your post build process. It automatically makes the change to your Info.plist file so you never have to think about it. You should be able to use this fix with Appmethod and C++Builder. Did I mention that TMS Software is on fire lately with their TMS All Access pass? Head over and check out the full solution for implementing the IOS9 ATS Info.plist key in Delphi 10 Seattle.